Apologies for the lack of content here recently, the plate of life has been overflowing lately and this little slice here needed to take a back seat temporarily. Rest assured, words are on the way. I'm in CA now, Napa to be exact, getting ready for the Single Speed World Championships. I've got a new ride with me, something I've been keeping under wraps until it arrived. 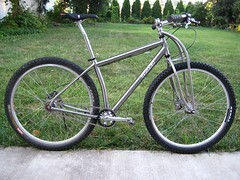 It showed up Monday, built it late into the night and got one test ride on it Tuesday before boxing it up for the trip. More words on all of this soon. Maybe I'll see you out here in the land of grapes.